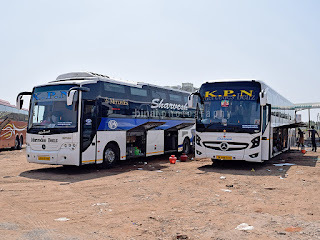 March 26, 2012; 5:30hrs: I checked out of my hotel room and headed straight to Mahatma Gandhi Bus Station (MGBS) - the main bus station in Hyderabad. My bus would depart only at 0635hrs - that gave me a lot of time to roam around the bus station. The bus station was too crowded for the time - may be since it was a Monday. I walked into the parking area to see if my bus was there - there was one Volvo 9400 (B7R), with its staff getting ready for departure. I was sure that would be my bus. Took a couple of pictures of some buses parked there, and returned to the designated platform. In the meantime, I got a newspaper, and some cold milk. The "Garuda" platform came to life with one Garuda bus being brought in - it was one horribly run down B7R heading to Vijayawada. My bus - KA-01-F-8507 was brought in around 0625hrs. 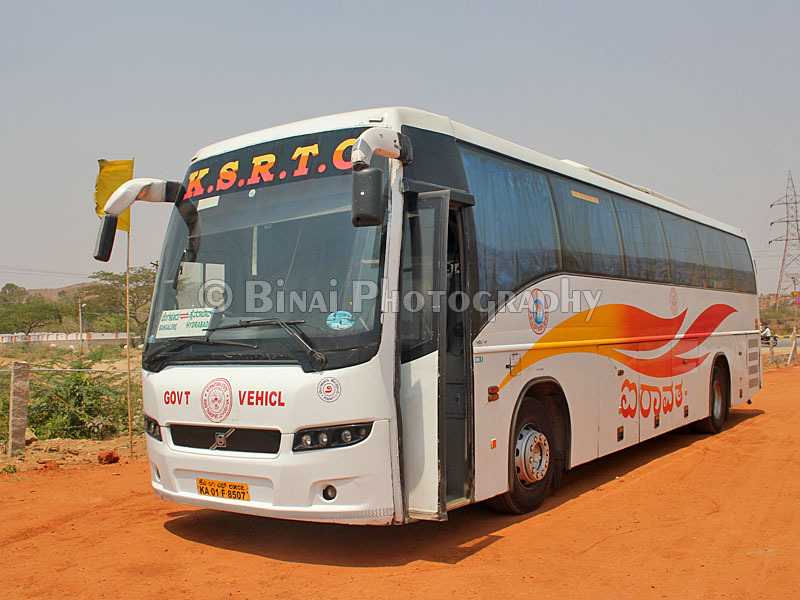 The bus: KA-01-F-8507 of Bangalore Depot-2. 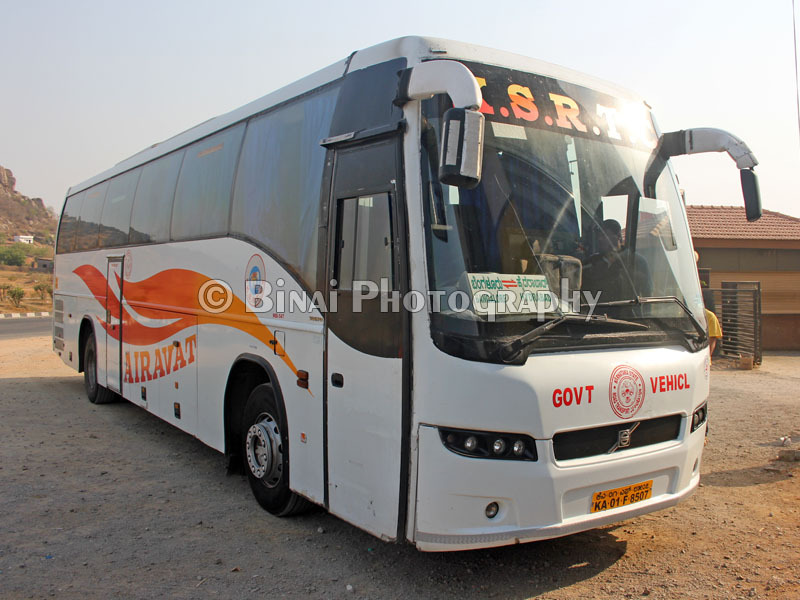 This bus had clocked over 8 lakh kms. The crew had a harrowing time to get off the bus - there were lots of "seat-seekers" trying their luck to get into the bus. The conductor somehow managed to get off and rushed to the controller's office to get the reservation chart. The conductor came back and quickly checked tickets of reserved passengers. I had my name struck on the chart and headed to leave my baggage in the luggage hold. The driver reconfirmed that I had a reservation. After leaving my bag in the bus, I headed out for some more photos. I returned just as the crew were preparing for departure. The bus was hot inside since the Aircondition was yet to be switched on. All the 45 seats were sold - most of them were reserved, while about 3 tickets were sold by the conductor. We started from MGBS at 0637 - 2 minutes past the scheduled departure time. Since all the seats were full, the crew did not wait for more passengers. 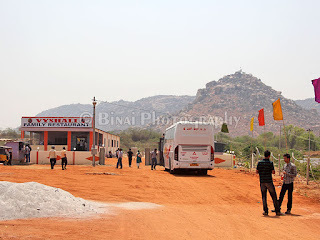 The bus directly got out of the bus station, and we were soon headed towards Shamshabad. The engine sounded "mature" - the bus had over 8 lakh kms on the odo! There were some niggling noise from the overhead racks - most probably due to improperly placed baggage. By the time the bus made it to the highway (past Shamshabad), passengers sitting on the last row were snoring off! I had to keep the curtain closed since the sun was directly on my side - and they did not play any music or movie. With not much to do, I too slept. I woke up only as the bus was pulling into a hotel for breakfast - at Jadcherla (0805hrs). I was actually shocked at the fact that the bus was just 5 minutes late from its schedule! My ticket mentioned that the bus would stop for breakfast at 0800hrs, and we made it there with only a 5 minute delay!! The hotel had a "prepaid" policy for bus passengers - that is, one has to bill his food first, and then collect them from the "Self-service" counter. The food was fairly good. I stocked up some cold drinks for the hotel and remained near the bus. The engine was off, and it was fairly hot inside the bus. The crew came in quickly and we started moving out of the hotel at 0831. The temperature outside got hotter, and the sun was directly at the window. I had to keep the curtains closed all through the time - the glass was hot, and the curtain too was getting warm. The Airconditioner had to work overtime to cool the bus - it was quite hot at the rear. The bus was full, and I was more or less over the engine. Some time after starting off from the break, I fell asleep again. The TV was not working and hence they could not play any movie on it. People around me were either sleeping or playing/listening to music on their phones. 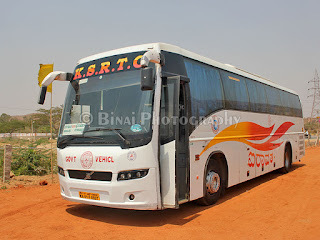 I slept for about an hour or so - woke up only when the bus stopped at Kurnool bypass (1014hrs). 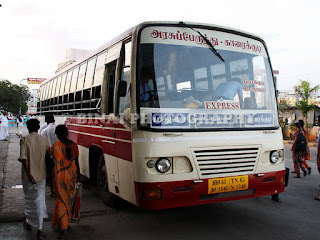 There was some seat adjustment drama inside the bus - a lady passenger was shifted to a "ladies" seat at the front of the bus, and a guy who was sitting in the conductor seat was shifted to her old seat. Another shot of the bus..
it successfully! We pulled into a hotel on Penukonda bypass around 1258. The engine was left running as the crew announced the lunch break and headed off to the Hotel. I got off the bus, but did no feel like having any food. I just had some juice and walked around taking some photos. The hotel was located just at the point Penukonda bypass takes off, on the Bangalore side. There was nothing around the hotel - just barren land around. I did some bus spotting on the highway. We started off after the break around 1328hrs. Just as the bus was pulling out, the passengers in the last row confronted the conductor and asked him to adjust the AC. It was getting hotter at the back, leaving all of us to sweat it out. I am not sure if the conductor did anything, but it did get a bit cooler later on. It is a ghat section after Penukonda. I kept tracking our current location on GPS, and get hopeful of being able to reach Bangalore on time as the journey progressed. I slept a while later only to be woken up by BSNL's "Welcome to Karnataka" message. We crossed Devanahalli around 1430 or so. The bus at the hotel for lunch. Things were good till then. The traffic worsened as we crossed the Clover-leaf interchange for Bangalore International Airport. It was one very heavy traffic snarl after Yelahanka. The bus stopped at Hebbal (1546hrs) to drop passengers - a huge number of passengers got off here. The conductor also announced that passengers to Marathahalli would get "connection" from there. As our bus moved, I did see a lot of passengers heading towards the "bus station" below Hebbal flyover. I did except some heavy traffic block after Hebbal - but thankfully, the traffic was moving. The bus kept spotting very often to drop passengers on the way. We finally pulled into Kempegowda Bus Station at 1614hrs. The scheduled arrival time was 1605hrs - so thats just a 9 minute delay!! 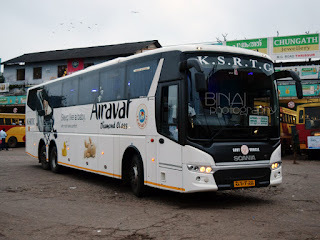 That was really good for a KSRTC Airavat! We did 570kms in 9hours and 37 minutes - not really bad for a bus that did a top speed of only 90kmph! Remarks: The bus was about 3 years old, and had done over 8 lakh kilometres. It was fairly well maintained - the AC was not very powerful though. The engine did not sound strained for the kind of torture it was subjected to. Our top speed on the section was 90.36kmph (according to my GPS). The driving style of good - he did keep honking most of the time, but was not rash. Braking was smooth and overtakes were well calculated. I liked the way the driver maintained speed all the time. They could have played atleast a movie (sadly the TV wasn't working). Being a full time day journey, a movie or some songs would've been great. Of course, there are two sides to this coin - at times, the movie gets irritating and one would prefer not having it. But then, when you have nothing to do, a movie would've helped matters. The interiors did show its age - the seats were mostly worn out and dusty. The bus was not really very clean - time the seats are shampoo'd. Hope this service would be upgraded to a Club Class soon. Ratings: Cleanliness: 4/5. Punctuality: 5/5. Staff Behaviour: 4.5/5. Overall: 4.5/5.